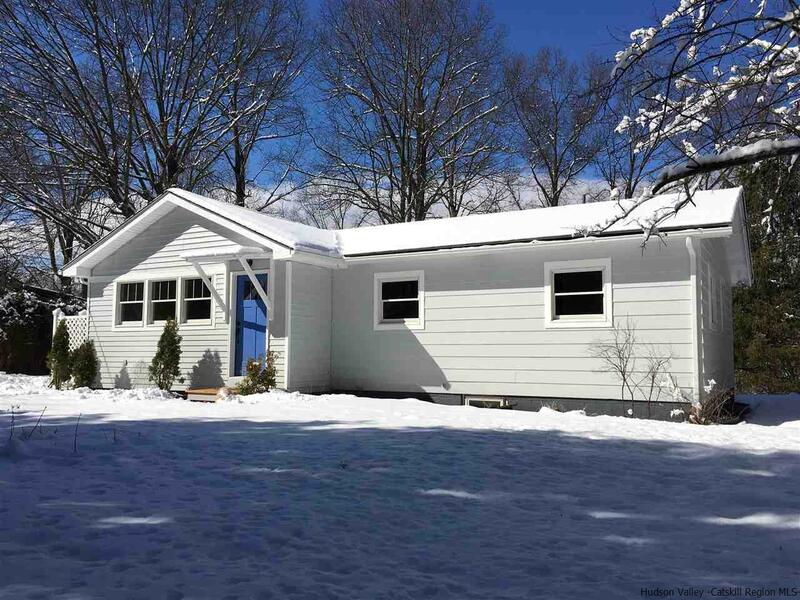 Nestled among the trees on a quiet country road just north of the village of New Paltz awaits this comfy-cozy, newly-renovated ranch. As you pull into the drive and peek inside the privacy hedges, you'll see the freshly-painted exterior with brand new roof and thermopane windows. Then step inside the front door to enjoy the large living room with stone fireplace, sunny dining room with new sliders looking out over the lovely rear yard, and beautiful brand new kitchen with white shaker soft-close cabinets, granite countertops, mosaic backsplash, tile floor, and stainless steel appliances. Down the hall are three nicely-sized bedrooms and a brand new bath, too. Additional upgrades include all new seamless gutters and leaders, new water heater, new 200 amp electric service, refinished hardwood floors, new recessed lighting and light fixtures. But above all is the relaxed feeling you'll get both inside this home and out. Hang out with friends for a cookout in the back yard or sit in a lounge chair with a good book in the peace and quiet. If you're looking for action, venture out for rock climbing on the Shawangunk Ridge, head up to nearby Mohonk or Lake Minnewaska for a day of hiking and a picnic, or bike along the historic Rail Trail. Conveniently, buses run multiple times daily between New Paltz and NYC; and, the train 15-20 minutes away in Poughkeepsie goes back and forth, as well. Best of all, at the end of the day, come home to quiet Walnut Grove, kick your shoes off, put your feet up, and relax.